The Conservation Commission has proposed a set of rules and regulations for the open space at the Fairfield Metro train station. Man's best friend likely won't be welcome in the Fairfield Metro Center's conservation area. The town's Conservation Commission endorsed rules for the 10-acre property near the town's third train station at its last meeting, and dogs didn't make the cut. Dogs are permitted on most town-owned properties under the commission's jurisdiction. "We anticipate that there is going to be a management plan for wildlife that is going to be implemented," town Conservation Director Thomas Steinke told the panel. "You're going to have a lot of ground-nesting birds in this coastal meadow. You're going to lose them if you have dogs." The rules for the Metro Center's conservation area, which will be the topic of a March public hearing, are identical to rules for other properties under the jurisdiction of the Conservation Commission -- with three changes. In addition to prohibiting dogs, the endorsed rules also would ban any other domestic animals, including horses; swimming in Ash Creek and a pond on the property, and climbing on protective fencing around railroad and electrical towers. Steinke said to commission members that he would anticipate that horse riders might come to the conservation area -- as they do to the town's beaches during off season -- unless they're prohibited . He added that conservation officials already have evidence that people have scaled the fencing at the site. "We can see things that they've left over the fence," he said. He said people may be motivated to climb the protective fencing as a short-cut to Kings Highway. Kevin Gumpper, chairman of the Conservation Commission, said town officials also do not want anyone to swim in the pond or Ash Creek. "Is that correct, Tom?" "I would hope not," Steinke replied. He said the creek still has industrial contaminants from when the property was home to a foundry. After being dormant for decades, the developer Blackrock Realty, LLC, bought the 35.5-acre site at 21 Black Rock Turnpike and won approval from town commissions to build nearly 1 million square feet of commercial space. 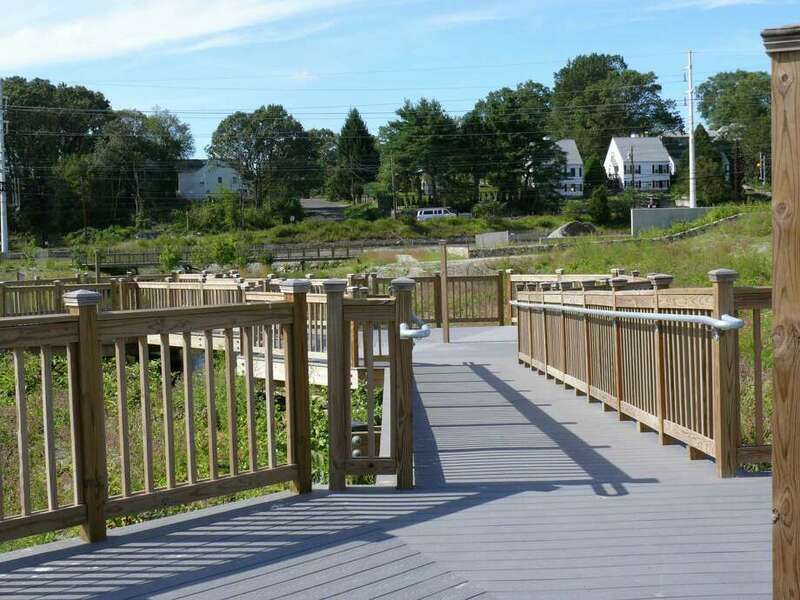 The 10-acre conservation area was the result of a perpetual conservation, open space and public access easement that Blackrock Realty granted to the town as a condition of a 2003 permit from the town's Inland Wetlands Commission. A part of the property was developed as the Fairfield Metro railroad station. The conservation area is designed for passive recreation, such as walking, jogging, bicycling and watching birds and other wildlife, according to a Feb. 12 memo from Steinke to the commission. Steinke envisions visitors would include neighborhood residents, employees and visitors of office buildings that are proposed on the rest of the Metro Center property, residents and guests of an apartment building planned on the site, and the general public. The public hearing on the rules is tentatively scheduled for March 20 at a time and location to be announced. The conservation area was recently closed to the public -- in part because rules didn't exist to govern usage -- and it may reopen after the rules become effective and Blackrock Realty "exerts management responsibilities on the property," Steinke says in the memo.